Morocco is an enchanting destination, with influences from the Middle East and Africa, as well as Europe, thanks to its French colonial history. This fusion of east meets west has culminated in traditions and cultural norms unseen elsewhere. One facet of Morocco (which differs from its North African neighbours) is the accommodation options. Whether you seek luxury lodging or a traditional homestay, Morocco has choices to suit every traveller. A kasbah isn’t a type of accommodation per se, but rather a fortress or citadel once inhabited by a sheik (Arabic leader or king). These elaborate medinas were traditionally built from clay and straw with tall walls and fortifications to protect against attackers. Morocco’s largest and grandest kasbahs are found in the High Atlas mountains in an area nicknamed the ‘route of 1,000 kasbahs.’ Ait Benhaddou, situated in the province of Ouarzazate, is widely regarded as the most magnificent ksar (fortified village) in Morocco. The 11th century kasbah has been used in many film and TV productions and is breathtakingly otherworldly. Today, many kasbahs have been transformed into hotels to give visitors a uniquely Moroccan experience. While the interiors are now lavish rooms, the exteriors are original. Kasbahs are typically located on hilltops or high ground too, providing guests with panoramic rooftop views. A riad is the most common and popular accommodation option in Morocco. Put simply, it’s a type of house or palace with an inner courtyard. A traditional riad, however, has a garden in the courtyard which is divided into quarters with a fountain in its centre. Riads are generally uncovered, enabling natural light to stream in along with the occasional fauna. Most riads feature grand archways bordering the courtyard and are decorated with Morrocan tiles and lush greenery, giving it a pleasant oasis feel. The illusion of space is another big feature of the design. Where large rooms aren’t possible, most have high ceilings. Typically two or three storeys, riads were historically the homes of affluent people such as merchants and royal advisors. 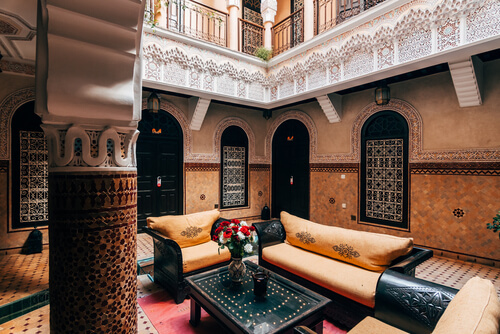 Today, many across the country – particularly in Marrakech – have been converted to guest houses so visitors can get a taste of authentic Morocco. The Berbers or Amazigh (free men) are a group indigenous to northern Africa with a majority residing in Morocco. While the majority of Moroccans having Berber ancestry, Berbers have separate languages, culture and customs. As Morocco continues to modernise, many Berbers have relocated to the cities, but head to the fringes of the Sahara desert and you’ll encounter many different Berber groups. With the influx of people visiting the Sahara and High Atlas mountains, many Berbers are opening their homes to travellers who wish to learn about traditional Moroccan culture. Guests are invited to sit down for a meal with their hosts and feast on classic Berber dishes such as spiced tagines and couscous. While the accommodation is basic, a Berben homestay is a brilliant way to connect with Moroccan history. When it comes to unforgettable Moroccan experiences, none surpass camping in the vast Sahara desert. Hop aboard a camel and take in the rolling red dunes as you head into the desert under the setting sun. Upon arrival, you’ll be greeted with mint tea and shown to your room. 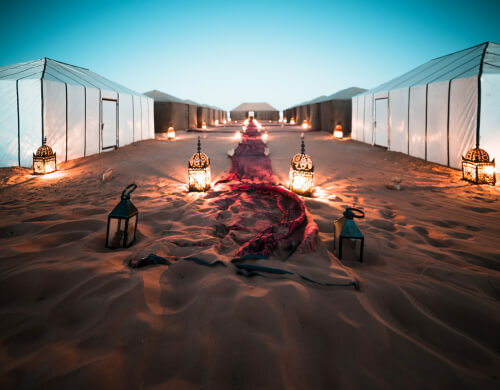 Sahara desert camps are far from regular campsites and include large tents, a power supply and real, plush beds adorned in Moroccan style decor. While the sun highlights the desert hills, darkness reveals millions of stars unmarred by light pollution. Sitting around an open fire listening to local Berbers play drums and sing songs is guaranteed to be a memorable night. An auberge is the French term for guest house or boutique hotel, typically found in rural areas and small villages. Unlike larger hotel chains, auberges are often privately owned and family-run. While the standards can vary from basic to luxury, auberges offer guests a more traditional lodging experience than regular hotels but have more facilities than traditional homestays. Auberges located on the edge of the Sahara tend to be the simplest, featuring glamping-style tents like you’d find at a desert camp, whereas those in more developed towns are closer to boutique hotels. Expect to find rooms adorned in local handicrafts and colourful bedding, often with Moroccan-style plasterwork and arched doorways.